Take your aim to the next level with a selection from the collection of archery stabilizers at Grabagun. One of the most important parts of being a good archer is the ability to aim the bow steadily and consistently, and the items we have available will help you sharpen your skills by eliminating many of the factors that may cause you to take a shaky shot. While an archery stabilizer is not technically a necessity, its use is strongly suggested by archery students and professionals alike. A stabilizer is typically screwed onto the bow using a factory-embedded accessory hole. 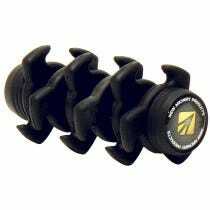 Archery stabilizers can not only help make your shot more accurate, they can help make it more comfortable by absorbing some of the vibrations usually felt when a shot is taken before they get to your hand. Archery stabilizers are also designed to help your bow stand up straight by adjusting the distribution of weight on the weapon. The extra weight added to the end of the weapon makes it more stable at the part that is farthest away from the shooter, and more vulnerable to elements and pressure from torque when the shot is fired. The weight prevents the bow from jostling around when a shot is taken, decreasing the likelihood of error. Choosing the length of the stabilizer is also a choice made by the archer, but you will want to factor the distance of your shot into your choice. Or, grab two or more options and change them out when you get more comfortable with the accessory. With brands from Apex to K-Tech and a selection featuring state-of-the-art designs and materials, you are sure to find a good fit for your game here at Grabagun.